Climate change is a bit of a buzz phrase at the moment, well I suppose it has been for some time. And hey, I’ve joined the band wagon because I think it is the right thing to do. A lot of people have an opinion on it and I certainly do but I also think that it is my responsibility to know as much about it as possible if I want to have a discussion about it. I think my height of frustration came about when living in Manchester in winter last year when a particular newspaper ran the headline along the lines of ‘How can global warming exist when it’s so cold in Manchester?’. The article pretty much went on about how it’s pretty unlikely global warming exists when England were getting so much snow…….ummmmm what??? I figure the best that I can do is to educate myself. So on my little project to find out about the world, on Thursday I toddled off to the National Theatre with two very smart friends of mine to listen to a chat between Tim Flannery and David Shukman. 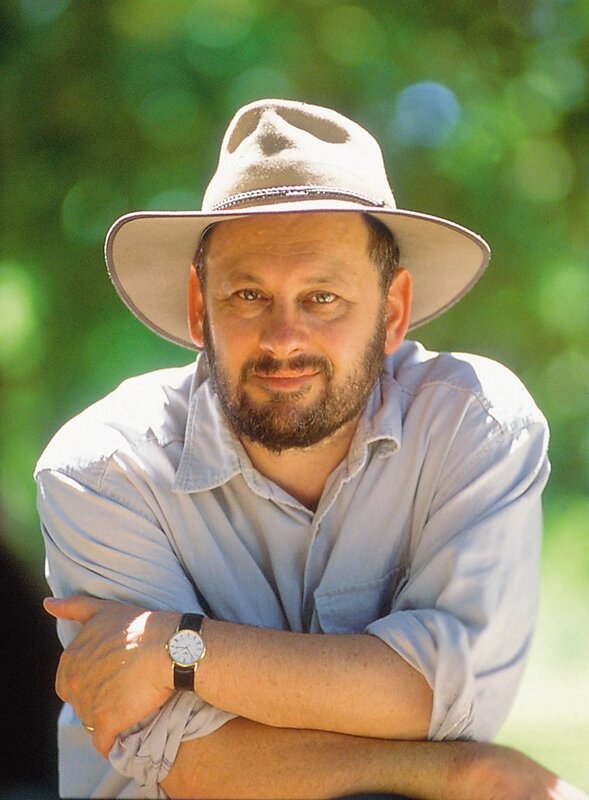 Tim Flannery is an Australian scientist and conservationist that has been around for a while now but hit the big time with his book ‘The Weather Makers’. This book focuses ‘on the history and future impact on climate change’. Now, to give you a bit of background on this man, he was the chairman of the Copenhagen Climate Council 2007-2010 (yep the same time as the Climate Change summit that turned into an absolute circus). Also, the most amazing fact I found about him is that as a zoologist he has discovered and named over 30 new species of mammals. Hells bells!! I’m stoked when I discover a new ice cream flavour, imagine discovering 30 new mammals! What a man! David Shukman I know even less about. He is a journalist that has travelled through the Arctic, Amazon and even to Tuvalu. He has done quite a bit of work reporting about the Pacific Islands and the problems they have with plastic waste and of course rising sea levels. Love your work Shukka’s – that’s my two bobs worth! So being the nerd that I am, I went ahead and booked three seats right in the middle, third row from the front to watch these men have a gander. It also gets worse, when the lights dimmed and I took out a notebook for me to take notes. Hell yeah, if I’m going to learn about climate change I’m going to do this to the max – much to the embarrassment of my two very intellectual tag alongs! Ok, so overall the chat was very interesting and wonderful to listen to. A part of the discussion that struck me most was when David asked Tim the question of ‘is the fundamental problem of climate change just a political problem?’. This question is one that I had never even considered before. Sure our earth is getting weary and not being treated very nicely and this is the core of the problem. But in terms of solving the problem is it mainly a fault in the politics of the world rather than us being able to actually fix it? It certainly would help if people (especially political figures) would address the problem and get around to fixing it rather than hanging around actually arguing whether the problem exists at all. However, I completely understand that to spend money on trying to find alternatives to the way we are used to living takes time and most importantly, the tax-payers money. In the conversation, Tim mentioned that humans are naturally selfish – of course we are. We have a knee-jerk reaction to protect ourselves and put ourselves (which I think includes the people we love) first when push comes to shove. The hard thing about climate change/environment/global warming is that it’s so easy to lump its disasters as one-off event that we don’t feel as if we can solve it in the if it ever happens again. 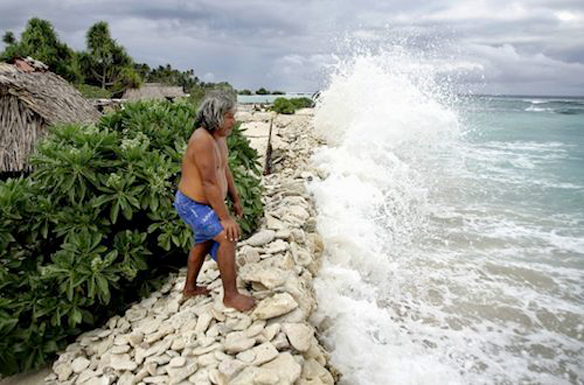 There are so many discussions on whether the sea levels are rising that I can just see the rest of the world only hearing about Kiribati once the I-Kiribati people are trying to get into other countries because their country is under water. And ANY bet these innocent people will treated like illegal immigrants/refugees. They don’t want to escape their home, their home doesn’t exist. The list of issues and problems is building and yet people are still chatting about whether the sea levels are actually rising. Way to avoid the fundamental problem. Hey, I’m no environmental expert but if a country is building a sea wall in their backyard when they didn’t have to 20 years ago isn’t that an obvious indication? Yeah yeah yeah I know, not everything is black and white and there are bills to pass, decisions to debate, money (or lack of) to spend but at the end of the day I think the fundamental problem is black and white. The sea is either rising or its not. A country will either be there or not. A culture is either there or not. And sorry to be cynical but people either care or they don’t. Next Post Check this cool cat out!